Post the results of your meets on MileSplit, and save time and energy by using MileSplit meet registration. Whether you are a coach looking to simply your local meets and save some time, the director of a major invitational, or the owner of a timing company that runs multiple meets throughout the year, you will find that MileSplit is the ideal place for you to post the results of your meets. Here are some reasons why you should consider using MileSplit for meet registration and results posting; below is a guide for anyone who wants to post results on MileSplit, no matter how small or large the meet. MileSplit tracks and links the performances of your athletes, providing you with an automatic record of their results. When results are posted in the proper format, they will be attached to both the individual athlete profiles and also to your team page. There is also the benefit that when results are imported, new athletes are automatically added to your roster (so you don't need to type them in yourself). Try version 3.05 instead of the newest version. If that doesn't work, contact me (jgeorge@milesplit.com) for an alternative method of submitting results. The MileSplit network provides the best exposure for your results, as we have the highest traffic of anyone covering the sports of track and cross country. You can also have the results posted to multiple state sites through a single upload. MileSplit meet registration makes the front end of preparing for a meet much easier by collecting all the entry information for you. This information can be downloaded in a variety of formats to suit the software you use. 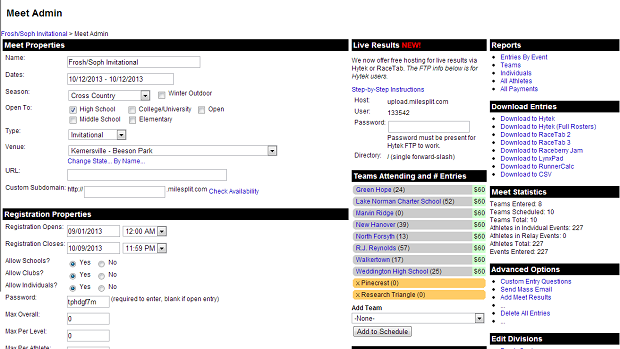 At 10 cents per athlete ($30 minimum), MileSplit is the most budget-conscious choice for meet registration.